I went into reading Divergent with high expectations and I wasn't disappointed. 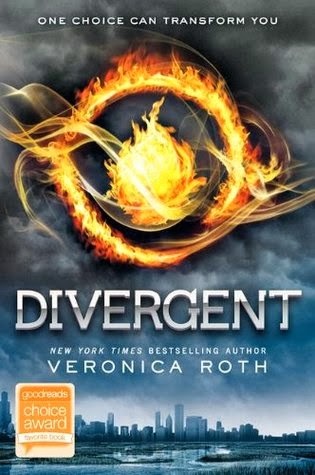 Divergent is action packed and I couldn't put it down, I was just hungry for more. Veronicas’ writing is simply amazing and the world she built was unbelievably real. The way that she categorized each human into 5 different types of people, into 5 different factions; Dauntless, Abnegation, Erudite, Candor and Amity. They way that Veronica came up with a way to separated people in that, is beyond me. They world she created and set up was perfect, I could picture what everything that was happening, and where it was happening. At first I was a little confused with the world but after a while I did get used to it and it made a whole lot more sense to me. I also loved the concept of how they became a part of a faction. The heroine of Divergent is 16-year-old Beatrice. I love her character. Firstly she is female 2nd she is totally, well she comes to be. She is everything I ask for in a main character and since it’s in her perspective it’s perfect. She is vulnerable in the right times, and strong when we need her to be. Four what can I say about Four? He is just amazing. From our first impressions, some people might not like him that much as he brought forward as this tough strong character. But once Tris (Beatrice) gets to know him so do we. There is so many under layers and you understand why he built this wall. I also loved with a passion of the foreshadowing we had of Four in one of the first few chapters. I loved how the relationship grew slowly between Tris and Four. It was nice for a YA novel to have a relationship to grow slowly. It was different and I think it was perfect. And I communed Veronica for that. I also liked that Veronica explore the theme of fear and how everyone has fears. And we need to sometimes overcome those fears in our lives. But sometimes we need to live with those fears. Which is demonstrated through Four and Tris. The concept of the tattoos, love it. I adore tattoos so I was very fascinated by it. It was very different and drew me in so much to the book. The ending was wow, just so many things happening at once, but I was so happy that there was not a major cliff-hanger. I sometimes dislike these major cliff YA novels but Divergent didn't have that. What are your thoughts on Divergent? Great review Angel! I also loved the action, the build of the romance and the themes about fear. One of my issues with the book was I felt there were too many extraneous characters who I kept forgetting existed until they popped back up later in the book. I think that made it hard to connect them, as you mentioned. I was also confused with which characters were transfers and which were Dauntless-born. But maybe that was just me. Hey, thank you. yes i think there was too many characters that you seem to forget untill they popped up again. hmmm yes I got a little confused with which were transfers as well, but i guess that did not really matter that much. I have yet to read the sequel as I have alot of books to read, but i cannot wait to into it.